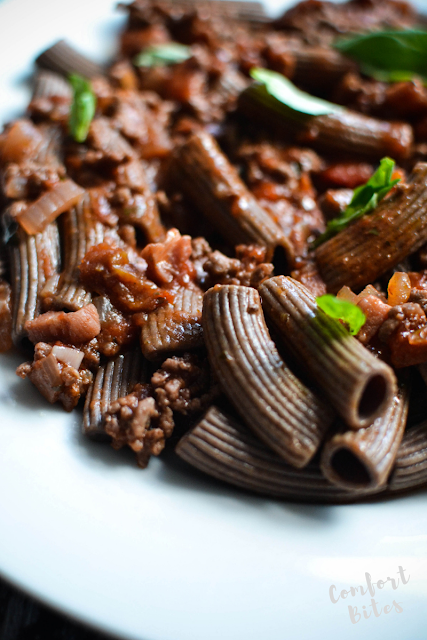 A rich, tasty Bolognese-style sauce served with Nomad's paleo pasta, made with flaxseeds. Totally gluten free and paleo. This post contains some affiliate links. This means that if you decide to click on a link and make a purchase, I may receive a small commission, at no extra cost to you, that helps me keep the blog running. Thank you for your support. There's something I thought I'd never see. A Paleo Pasta Spag Bol kind of a dish - with actual pasta and not zoodles. The pasta is the Superseed Flaxseed Penne that is available on the Nomad website. 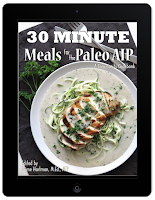 It's paleo, gluten free and soy free, too. And my kids had no frickin' idea that this wasn't regular, gluten-free pasta and was in fact packed with super healthy, anti-inflammatory flaxseeds. They even ate seconds. YASSSS. 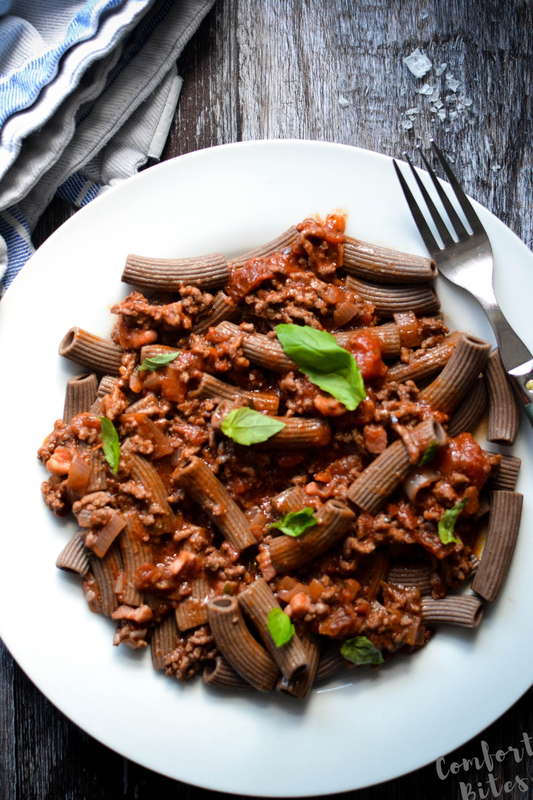 The sauce is rich, with flavours of the beef of course, along with smoky pancetta, sweet tomato and fresh basil. The flaxseed pasta is dark, and looks like it's going to taste really wholemeal-like, but really doesn't. It tastes a little nutty, but then I think the best things are. You're going to love it. First, heat a large frying pan and drop in the pancetta. Sizzle the pancetta and stir-fry, until some of the fat is released and the pancetta is slightly golden. Tip in the beef. Break it up as you stir-fry, and keep going until the beef is well browned. Tip out any of the excess fat, if there's any, left in the pan, or the sauce will be too greasy. Put the pan back on the heat and finely grate the garlic into it, and add the chopped onion. Stir and sizzle for a few minutes until it smells aromatic, and then tip in the can of chopped tomatoes and the passata. Season with a good pinch of salt and turn down the heat. Simmer for 10 minutes. While the sauce is cooking, get on and make the pasta. Heat a pan of water with a pinch of salt and bring to the boil. Tip in the packet of pasta, stir once, carefully, and leave to boil gently for 5 minutes. Test a piece of pasta - it should be firm but tender. Drain, and serve on warmed plates with the bolognese sauce. Have you made this recipe? If so, share it with me on Instagram @joromerofood - I'd love to see!